Well, I've got plenty on my desk, thanks for wondering. A short (I promise) tour is in order. First I must tell you that I have tidied. Yep. I decided to excavate a couple of layers and make a start on another Christmas card. Yeah well, that didn't work out, but it was a super excuse to listen to some of Jane Austen's Persuasion whilst I erm, sorted buttons. So you see the buttons, the drink of ribena, the passport photos of Mr Dunnit (they look like a police mug shot). The handles of the Cropadile, put away in the place that is exactly geographically opposite where it should be put away. The pile of double sided tape rolls..because the ATG gun is still empty. I need to use up the tapes first I think. There are new dies. Yum. Except they can't really be that exciting because they've been there, albeit buried, for a fortnight. Still, no doubt in another fortnight they'll at least have been put away, if not used. At the back is the corner of a large envelope. it's an order from Snapfish containing photos from my birthday. The idea is that when the mojo deserts me (now), I will go through my papers and etc and pick stuff for making LOs..ready for Crops. Hmm. Turns out that this good intention makes me think I don't have the right papers. Amongst the many hundreds. How ridiculous. Best thing about the desk - the sun continues to shine; photo taken late Tuesday afternoon. So now, using the instructions at the top of the page if you need them, please join in and show us what you're doing at your workdesk, wherever! Post on your blog, link it here and we'll visit as son as we can. Cue surge in the national grid as we all go and put the kettle on! Well, I do! So I was asked by the good promotions people to tell you about The Stitching, Sewing and Hobbycrafts Show (we used to call it Stitches...even when it was dominated by paper..). Manchester - 11th to 13th September. Exeter - 25th to 28th September. Both venues will have workshops and of course, bags of on stand demonstrations. The respective web sites (linked above) have a gallery of pictures from previous shows to give you a taste of the atmosphere and helpfully, each site also shows a list of exhibitors, which makes tracking down the stuff you need so much easier, before you start the real browsing! Check out the features pages on these sites too - there's more to each show than you think, and they'll help you get the most out of your visit. Of course, promotion on this blog comes with a price and I have 5 pairs of tickets for each show to give away, which is very generous don't you think? (Not of me...the promoters!). All you need to do is comment on this post and say which location you'd like tickets for. It will be a random drawing, in about three weeks. We went away very soon after the WOYWW 5 celebration and very soon after that, I was ill and you enjoyed quite a prolonged blog silence. Whilst I was sitting in my armchair being a tired old woman, I had company in the form of art. 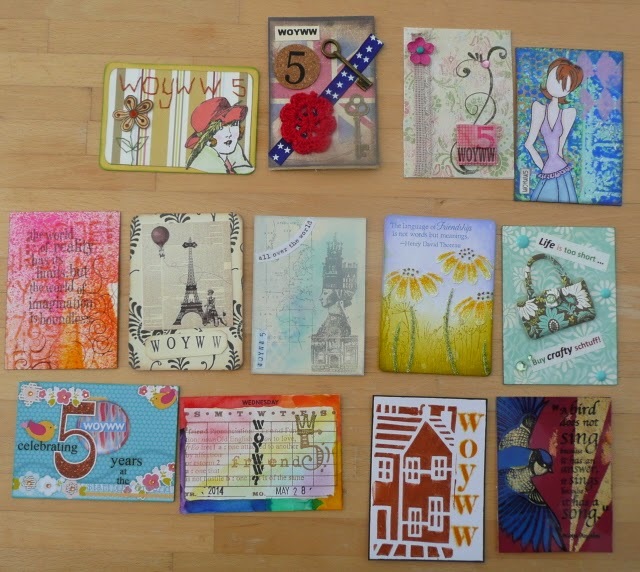 The ATCs that so many of you were generous enough to give or send to me. And some of you had to jump through hoops to do it too, I had no idea that the 'contact me' for this blog now uses a Gmail account. Now that I do know, I'm checking it, honestly! 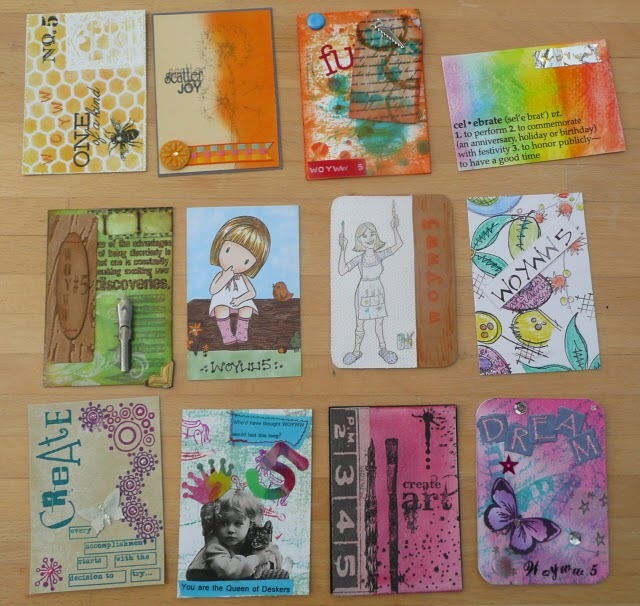 I thought I'd group the ATCs into colour or technique order for photography purposes. Immediate fail. It was hard, I couldn't decide and Mr Dunnit was, well, less than helpful. He did defend himself by saying that he wasn't technique savvy, and I might have suggested that he didn't have an eye for colour either...so in the end, I did what any sensible human would do...laid 'em all on the table and photographed them. Really, me, over thinking things....not usual, to be honest. The over riding theme of this year's ATC swap was without doubt, friendship. And I don't wanna get all speech maker and pompous (and you KNOW that I can), so let me just say that I think your art truly reflects the 'spirit' of WOYWW. S'about friends. And you genuinely don't need to thank me for that, as so many of you do. It's entirely within your control. I think it so easily could have become a bit of a clique and died a death. But your interest and inclusivity perpetuates the enjoyment, and the anniversary swap was really the tangible evidence. Oh sorry..I did get all pompous and speechy. I'm available for speaking you know, air fare, board and fees to be negotiated. Ahem. 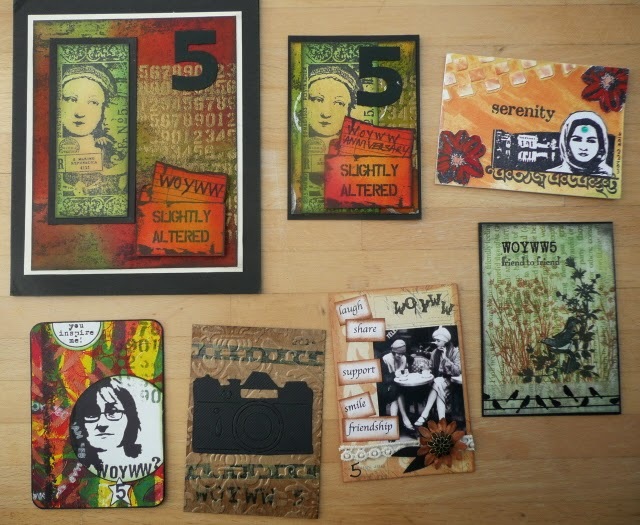 There are stories to all of these little art pieces too - 'out of the comfort zone' techniques, first time ATC makers, stitching, blending, scanning, printing, carving your own stamps. A lot of thought went into every single trade and in my case, quite a lot of feverish finishing and a little panic. 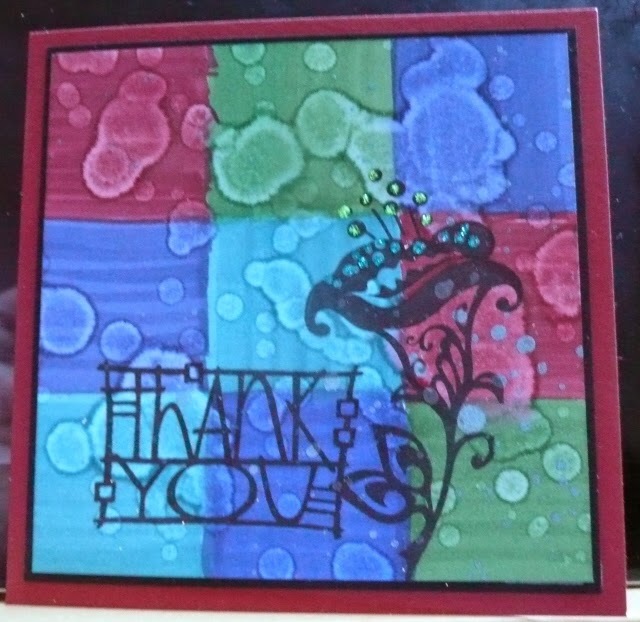 Belatedly, thank you for the ATCS you made and sent to me. I love each one and they have a proper file, so will be enjoyed for yonks. Thank you mostly though, for joining WOYWW. I hope you get as much out of it as I do. I've been ill, you know. Luckily, me and the Shopkeeper Gal had the foresight to see this incredible British summer coming and scheduled today as a Summer Grunge workshop. A bit of messy, some squirting and spritzing...and yes, I did use the mini mister to cool me down a bit - boy it was hot inside those lovely big shop windows! Here's what we did - for a workshop with Grunge in the title, some of them are a bit clean looking, but the inks and techniques made a mess - and hey, that counts for me! Still clinging to the doily fad...if it's already over, please be good enough to let me know, I'm always behind and as I'm trying to remind everyone in an effort to cover up my mistakes, bad memory, tardiness and general slothfulness, *I've been ill*. Stand by for stretching this out. A long, long way. The brick embossing folder has to be one of the most irritating things to use EVER. Seriously, it takes me an age to work out which way to put the card in so as to get the bricks in relief and not the mortar. So for workshop purposes, I actually worked it out and stuck a note on the folder! Genius! OK, maybe not to you, indeed, it may be an overdue move, but I have been ill, you know. I don't have a system of cleverness that makes me pull out stash and resources that suit each other before I plunge into a making session...the most I do is browse my stamps to get a subject idea going. 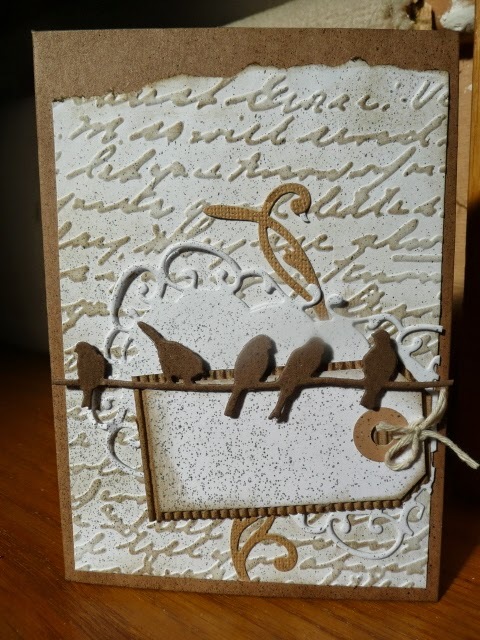 So I'd got as far as completing this birdy card when I realised that actually, apart from a few bits of sponged on DInks, it wasn't very grungy. (Even though the others aren't particularly...I have no idea why it should suddenly bother me!). So I squirted it with the DO Crafts spritzing ink, a sort of goldy black. And then of course, inevitably.....I didn't like it. It took away all the contrast between white and kraft. Ah well..at least at the workshop I was able to warn the gals and give 'em the choice. I didn't re-make it. I thought I'd be humble and hold it up as an example of how not to follow my samples too slavishly. Also, I erm, ran out of time. I've been ill, you know. And honestly, thank you for all your enquiries and encouragings and comments about it. I really am better now...waaaaaay behind, but 100% well. But please, keep that to yourself...I think I can get Shopkeeper Gal to continue to cut me some slack if I don't tell her. Well, there are two ways to think about my desk. One would be to give me a halo. I've spent the last two days tackling paperwork. Business and private. I've done an overhaul of Insurances Assurances and Pensions including shredding a ridiculous amount of old stuff. I've sorted the administration of our teeny section of Spain, I've got the work books back up to date. I'm feeling as if I'm getting somewhere. The other of course, is to call me a fool for sullying the creative with admin. I know. What you see today then is many fold, but in layers. The ipad, after a Skype convo. The forms are all to do with an Insurance claim. Yawn. On the far right is a Christmas card from a paper designed by my sister. It's last year's, but was in my inspiration section and is now within my line of vision because yes, underneath all the admin...there's a nacent Christmas card! Me and that Scrap Lady Ally have announced the date and open booking for a September Christmas Card Marathon. Shopkeeper Gal is talking about Christmas going on in her next workshop schedule. So I'm belying the sweaty heat and gorgeous sun and getting the love of snow on. I'm not, but I'm sure the more I do the more I'll feel in the mood! I will treat you to a proper view of two very obscured pieces of artwork in another post. Honest. Meanwhile, show me up and teach me not to use my desk for anything other than fun...post a pic on your blog, link it here and we'll trot round for a visit. Please understand though, if I don't get to you one week, I will another! No, it's not a newly created award.....although it could be, and we could use the acronym..TOOS. I quite like it! Gosh, I digress already. 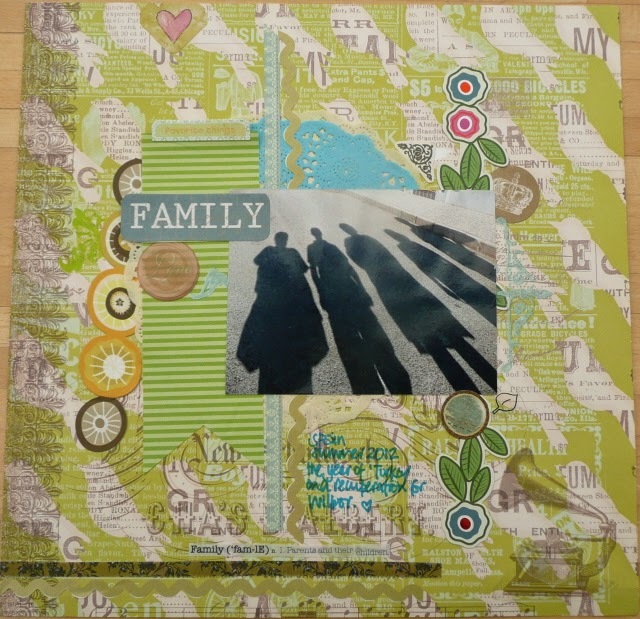 No, this is a serious post about the Order of Scrapbooking. Layout = page with photos on it, abbreviation for which is LO. 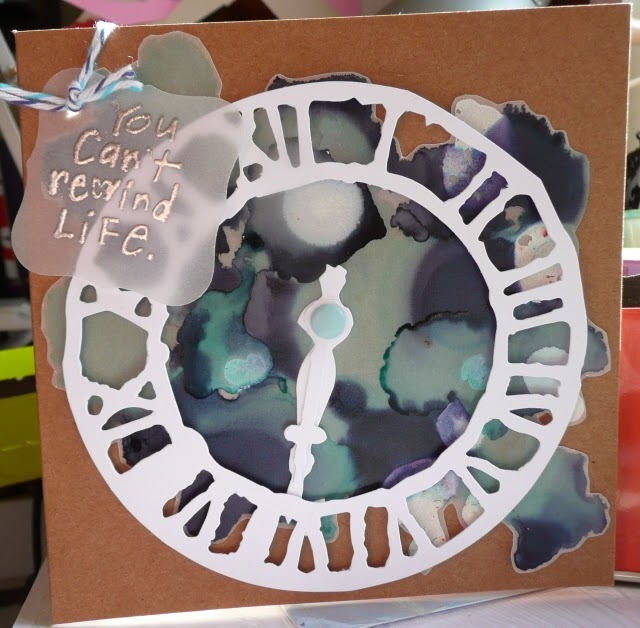 Years ago - 3 or 4 probably, when I was star struck and followed the blogs of celebrity scrapbookers, I remember being surprised by a post or comment made by the unmatchable Ali Edwards. She was talking about the great piles of Layouts that she had waiting to be put in order and filed in their sleeves, and ergo, the albums. I kinda dismissed it as I think Ms Edwards has the most splendid control going on and if she doesn't file her Layouts at the time of finishing then hey, thanks for the evidence of a chink in your order. The one thing I do in terms of tidy, is finish a LO and file it in the album straight away. I like the closure. It gives me a sense of accomplishment to see the album filling. As previously, and probably often, discussed, I don't make LOs in any sort of order at all and they certainly are not chronological. Chronological makes me lose the will to live. And besides, back in the day of photo developing, I didn't write on the back of the photos and I'm jiggered if I can remember when most of them were taken. Therefore...my eight or nine full albums contain LOs from across two centuries, three generations and are in the order that I scrapbook the photos. Which is entirely down to my mood on the afternoon before I go to a crop. Which as any regular reader will know, is an afternoon of torture in the choosing and the packing. Except the choosing of photos part..that's easy. I flick through the enormous number waiting for me and just select ones which 'speak to me' that day. So - how do you? Are your albums in order despite the un-ordered way you scrap? Or do you scrap in a particular order anyway? Or are you the type that leaves them in a finished pile, waiting. Or...do you like to re-arrange the albums? I can see pleasure in this, re-visiting all your works of art. 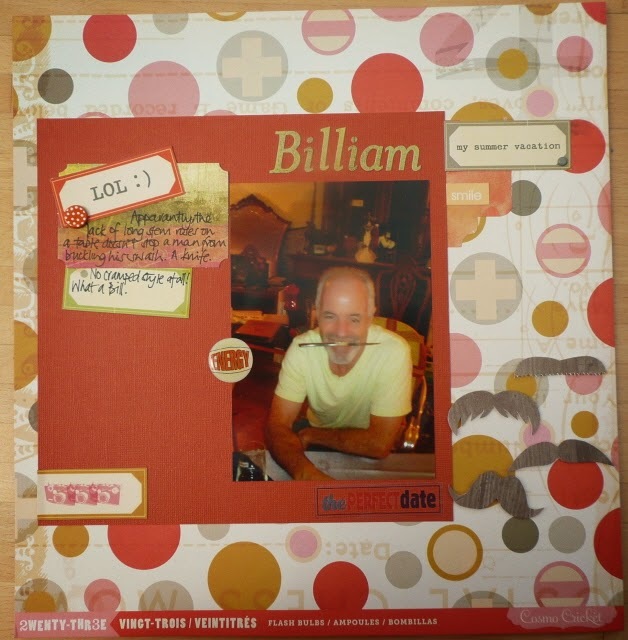 To the scrapbookers eye, from first to most recent, my albums certainly show the evolution of my scrapping style and (I hope) the change in my habits as a consumer of ephemera, embellishments and erm, such. So perhaps, in a sense, they are in an order. I don't particularly scrap with an eye to future generations to be honest, I scrap because I like it. As an only child, I'm fairly sure Miss Dunnit will enjoy having the album collection, but if at my tragic demise she decides she can't or doesn't want to keep them, that's fine; see, I've had all the pleasure! But..if she does want them and decides to use them to tell her part of our story...perhaps I should attempt a re-filing session? I dunno. I might leave it until I'm in my dotage. It will be something to do, and I can bore the pants of the day care with all the stories. 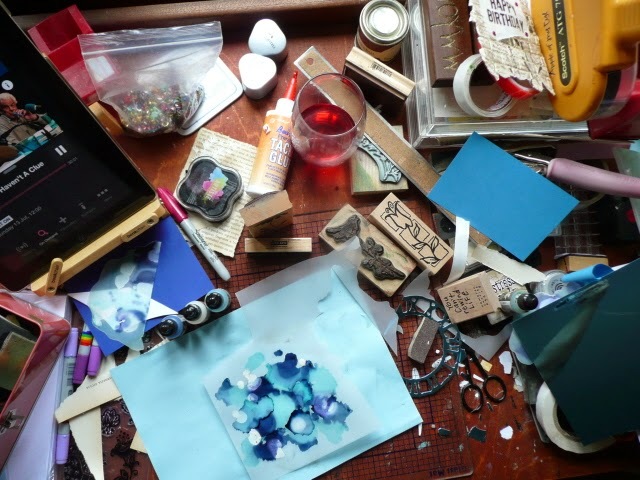 What's On Your Workdesk? Wednesday 267! Hello! WOYWW - What's On Your Workdesk Wednesday is explained and there's a 'how to' in the links shown across the top of this page. Other ideas with ridiculous acronyms are probably available. This taken at twilight on Tuesday. 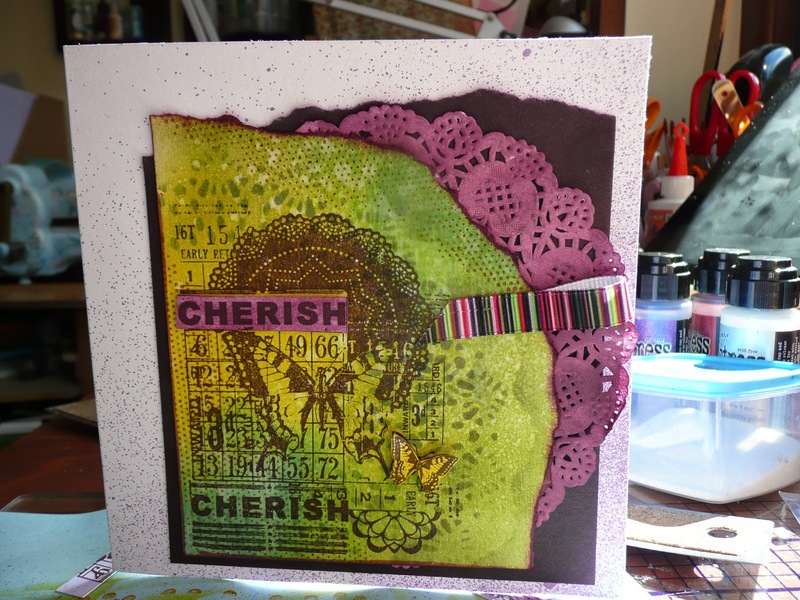 I'm working on the last of some 'Summer Grunge' cards for a workshop. I aim to deliver the samples today, so I hope this last one comes together as I see it in my mind's eye! Glasses abandoned where I can guarantee to find them (! ), card with glitter glue on it drying in the open stable doorway, part of my Distress Stain collection standing to attention waiting to serve. See the weaklings that fainted in the heat! Two pairs of tweezers at bottom right, and neither of them much good..it's a tool I can't work without but I really need to stop putting up with these and find a really good replacement. There's double sided tape on my 'stickys drawer'..because the ATG has run out; I guess because of my inattention over the last few weeks I haven't seen the end coming in time to order more...but that's OK, it's not exactly heart breaking or life threatening. The main thing is that in a slow and ponderous way...I'm back at my desk. If only ideas would transfer from head to card much, much quicker! Inspire us do, please show us what you're up to this week by photographing your work surface, brag a little about it on your blog and link here so that we can visit. No blatant advertising please - this is about you and your desk, not about your business, multiple links to products or guest appearances. Thank you! Bubbles and blobs. Blobbles, then. On my workdesk post last week - indeed, on my last post, I had a sheet of vellum with loads of drips on it. This is what I did with it. 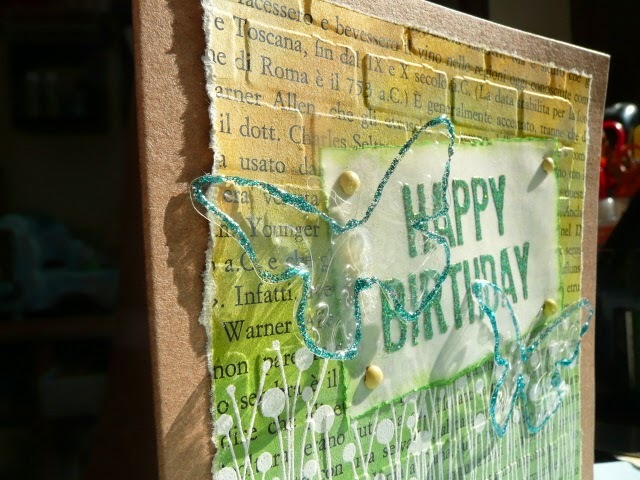 Funny hting, vellum, it's non absorbent and without a grain, so it never quite behaves as you think it should. I like it. For this, I dripped two colours of alcohol ink onto it. That's all. The white is actually a pearlescent mixative. From the same range. If I owned more than three colours of alcohol ink, I may well have spent the whole afternoon creating these backgrounds, I really like the effect! And better yet, the bits that took a while to dry - heat gun the granny ut of them, they soon dry up and of course, the vellum barely turns a wrinkle. This card was for a 'backgrounds' workshop, and in the spirit of balance on my blog, I shall add another photo. Because I can. And this features blobbles too. These squares are coloured with Copics, and then alcohol blending fluid is sort of dribble/come splashed over the sheet. Then stamped. Rocket science it is not! More learning for me too - if you don't use your Copic collection for ages (prolly 18 months), you should expect the odd one to be a bit dry. Ah well. Learning learning! Use the links in the bar across the top if you'd like more information or a bit of a 'how to' - although it's very easy to join in and we're not dangerous! Well looksee everybody - she's actually doing something at her desk! Yep..this was taken on Tuesday afternoon at about 4pm. By 6pm it was such a mess that I was happy to back off and leave it. Honestly, I may want to be stamping and playing, but the inspiration part of my brain doesn't want me to be! You can see my trusty iPad, playing some comedy which I love. Alcohol inks dripped onto vellum is the blobby mess you see - I like it actually, and will probably show the card off at some point after the workshop. The stamps are cast-asides that I've picked off the shelf to use and either used and erm, cast them aside, or not even bothered to use them. The Copics are for an entirely diferent workshop that was postponed whilst I was poorly, and the rest is frankly, just rubbish! 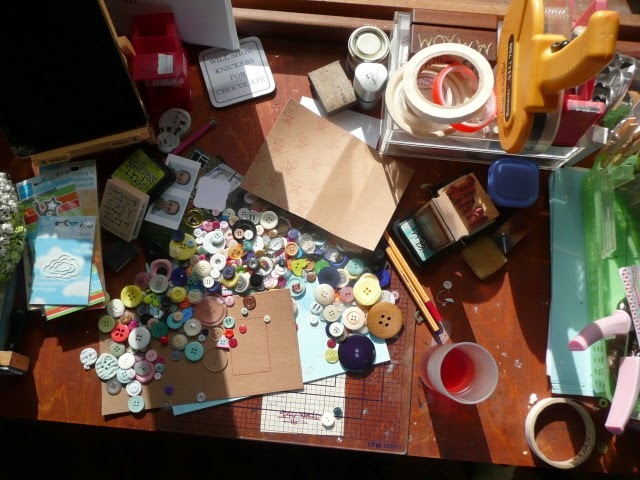 I'm getting there, and there's no doubt that your desks are more interesting than mine, so join in and inspire - purleeeease! Although y'all know a lot about me because of this blog, there's still a lot you don't know, obviously. And even on Facebook I haven't filled in a huge amount of detail on my profile. Like the fact that today is my birthday. This isn't an advert, but it's a sudden and big number birthday, and rather unusually, I have something to say. You do finally get to that age don't you, where you know yourself. For me it was certainly through my thirties. And then in my forties, I started to realise how empowering it was to have a first world life and all the rights and privileges that come with it. And as my forties ended, so I'm in the bit where I'm more interested in the people in my life and the happiness they bring me. I'm old enough to accept that there are people who don't like me, and I no longer work to bring them around. No time. Don't feel the need. Unlike thirty years ago. I'm old enough to know that I make snap judgements, and now wise enough to accept that these are often wrong..and I've learned the art of graciously admitting that. I am intimate with my faults (and there are many) and because I can recognise them, I strive to make sure they don't surface. I am forthright, but I hope I'm at the least a bit tactful about it. I'm hopeless at staying in touch and I hate that. 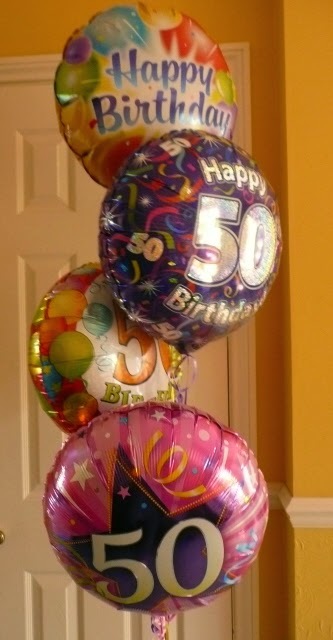 I had relatives here over the weekend and I realised that I'm more like my maternal Aunt than I thought - she and I share this birthday, perhaps there's more to it than I thought! I'm all or nothing: sad or happy, quiet or noisy, grumpy or happy. Black and white suits me very well in terms of understanding and I'm tolerant. But not entirely patient. And although I like to think you could teach me some new stuff, and that I'm open to learning, I also know that I'll never read a manual before turning something on and expecting to be able to use it, and I work better to a routine. I also know enough about myself to know that as much as I like to think that I can, I'm probably not going to change much. So now, onwards and forwards. I may be sentimental but I'm not a backwards gazer, I enjoy the memories and am thankful for my past but don't spend any time trying to recreate it or talking about it. And generally, I have no regrets. Except that I didn't teach my daughter to have an obsession about tidying up. But then I couldn't have could I? So if you're approaching any sort of big birthday....take my advice. Surround yourself with the people you love having in your life and make friends with yourself. When you've done that, there's a lot less to be serious about. Oh there's pages to reference across the top of this blog if you would like to know the why and the how of WOYWW. And then, join in! So my desk this week is another excuse really. 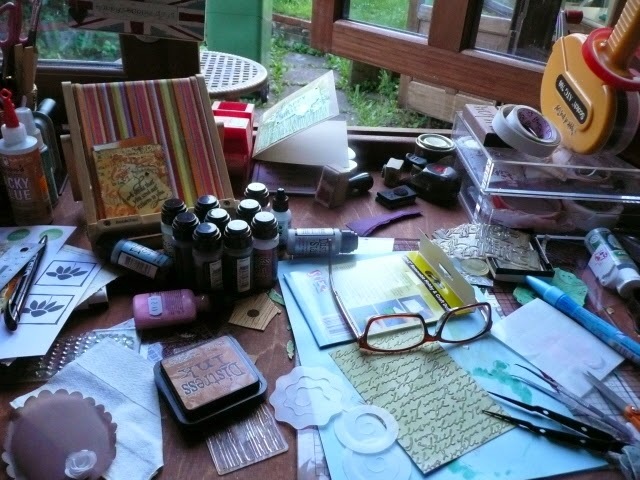 I've been a bit poorly and so my real craft space is unused and rather neglected. 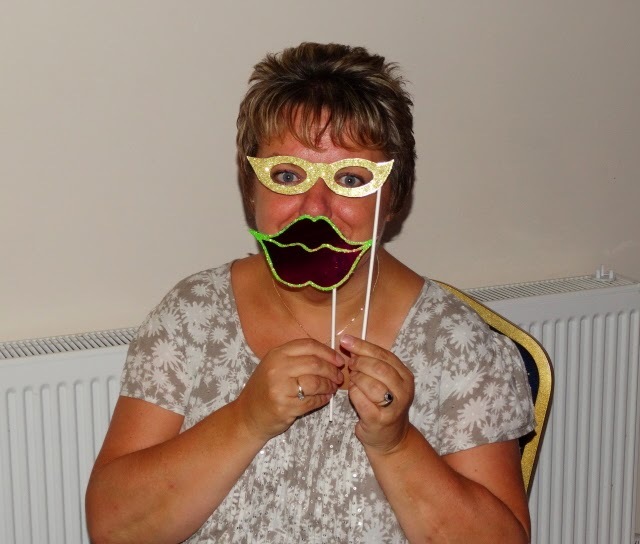 But, I have a bit of a 'do' coming up and was planning to make props for a photo booth. 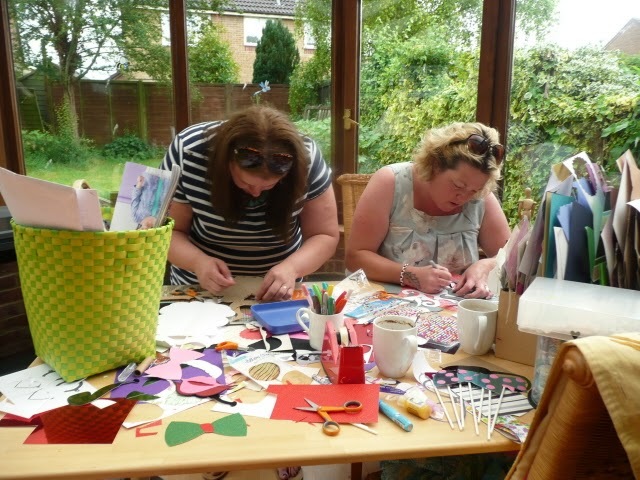 I've scaled my plans back rather significantly, but the props were made, and here are the makers, at the table in the conservatory.....meet Laura and Ali. Sunglasses on heads..because they're very trendy...and it had just finished being sunny and had poured with rain. They are decorating beards, glasses, moustaches..you know the thing. I was doing the strenuous bit and sticking them onto the cake pop sticks. Honestly, my will to craft is not bouncing back as I thought it would! Note my 'scrap box' on the right - so large and full that really it's hard to distinguish. I know many of you would love a deep green garden view like this...but in the 10 days we were in Spain and the 2 weeks I've spent sitting in a chair looking at it since we got back, it's turned into a jungle and I'm really at the stage of trying not to look! 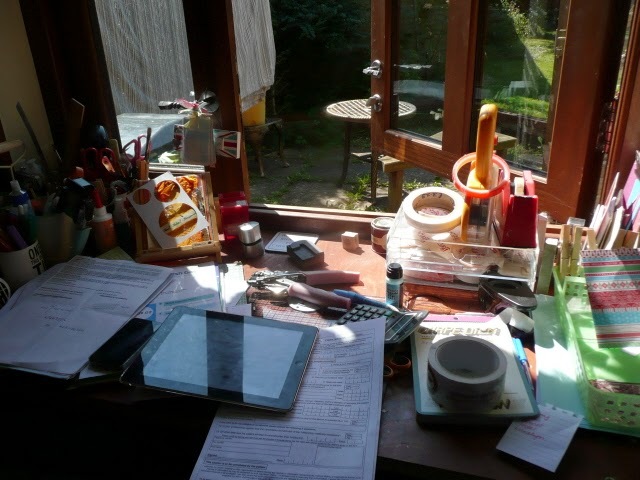 So there we are Deskers - now show us yours please - as much fun but possibly more tidy than this view. Although - and don't faint...I have cleared and tidied that table top completely since 'we' finished! The thing about being on holiday is that in some tiny way, you can be someone you're not, really. I mean, on a normal day in Spain, I shower and dress for supper! This is not normal behaviour at home...sorry to anyone that thinks we're all living in some sort of Downton Abbey style. We aint! Of course, my camera phone photography makes it all look a bit more garish than it really was..but you get the gist. As you may know, my holiday was interrupted by a stay in hospital - I'm not going to go on, but I wanted to show you this to illustrate my trendy holiday persona. On the morning that I was discharged, I was allowed breakfast, and the lovely lady that delivered the meals was quite excited about my tray. Between us (my limited but expanding Spanish, and her brave and limited English), I understood that she had an English treat for my breakfast. Tea! And manners and joy at the lady's efforts to make me happy meant that whatever was in that mug, I was going to drink it. So colour me trendy...it was Green Tea. It was the first warm drink for 6 days and it was absolutely horrid. But I drank every drop. And when the lady came back for the tray, we talked about English breakfast and she seemed very happy that I'd enjoyed the tea gesture. And I did really. Because it made my holiday persona so trendy again. And because the delivery of it was so nice. And when she'd gone, I reverted to un-trendy old woman type and gulped down that apple juice as though it was the first flavour I'd ever tasted. Not ungrateful, just not on trend. I'm an English- Breakfast-Tea-at-about-5.30pm-please type. Linking with Elizabeth for T stands for Tuesday. It's been a while!